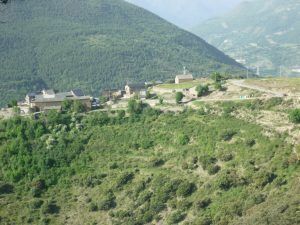 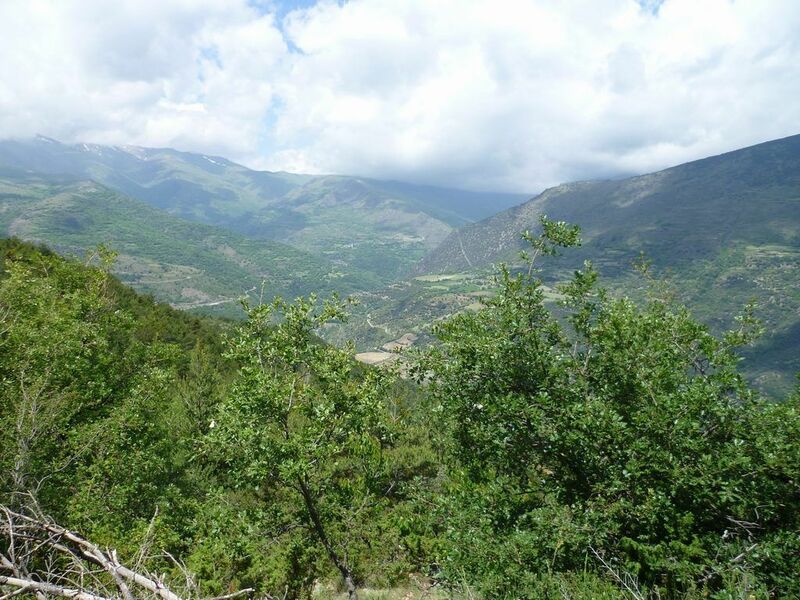 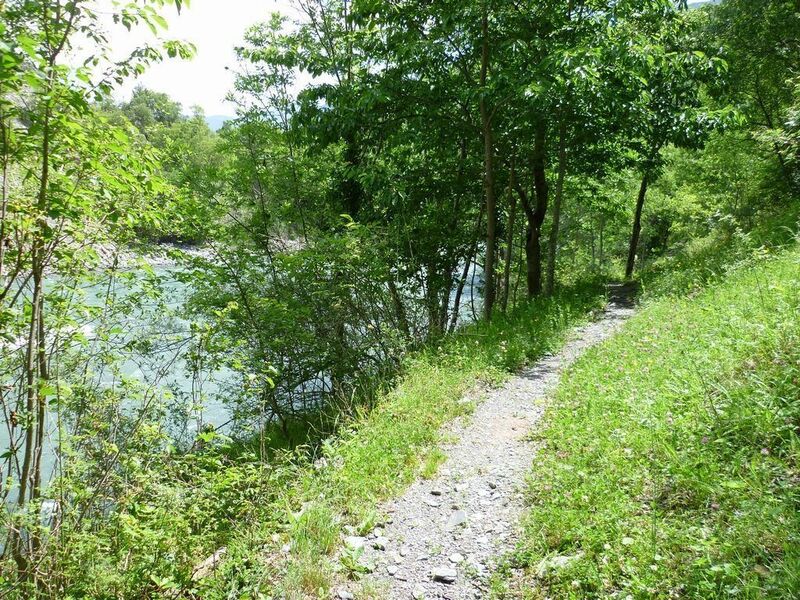 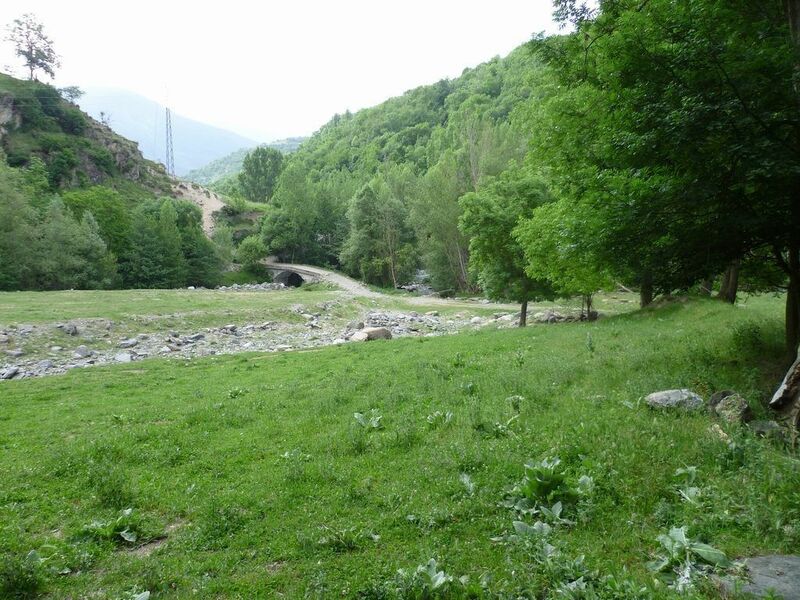 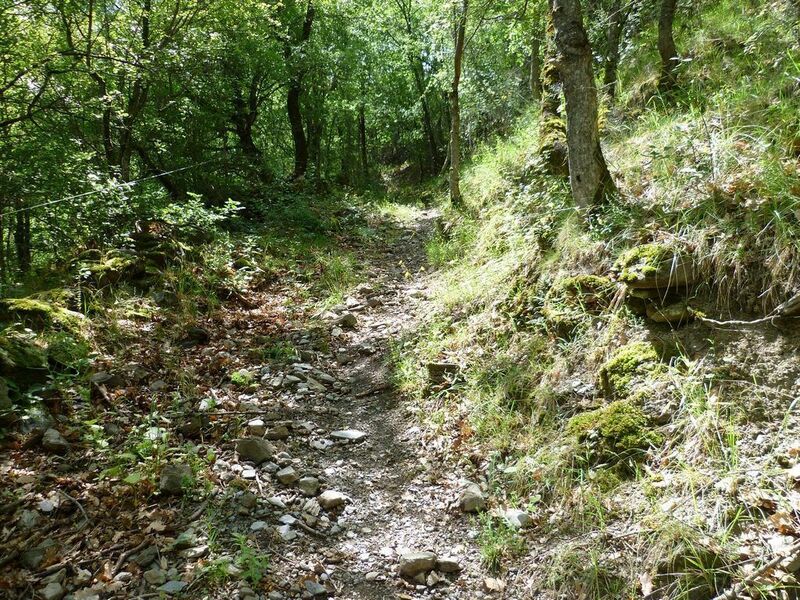 Rialp other trails, routes to enjoy calmly the surroundings of the village. Circuit available all year round. In winter being vigilant to possible frozen areas in the Canerilla fontain. 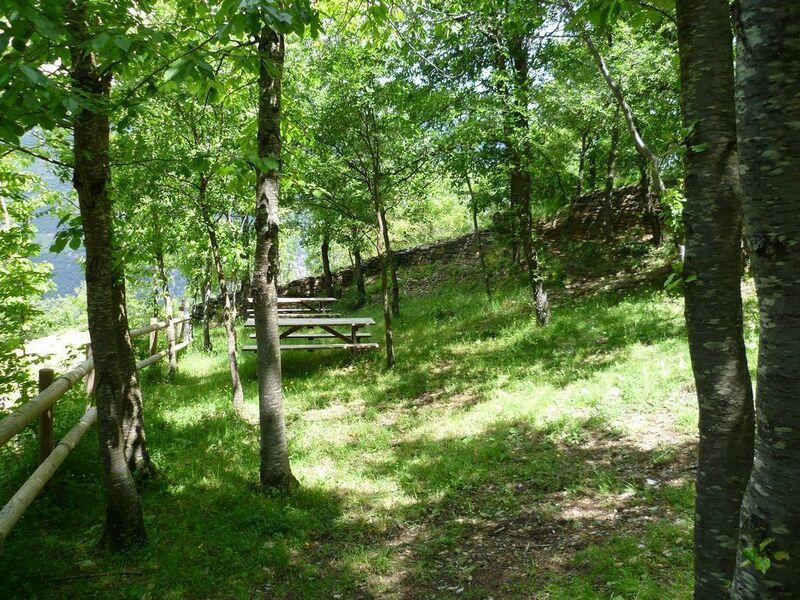 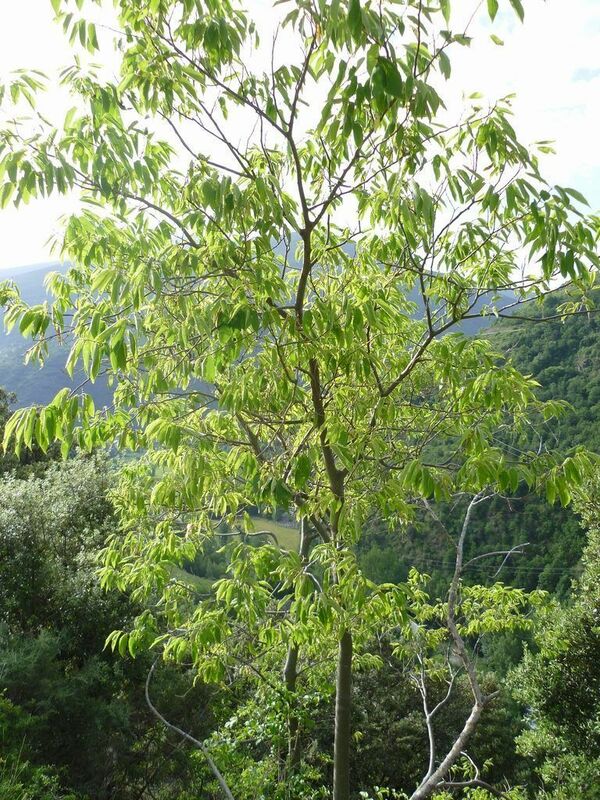 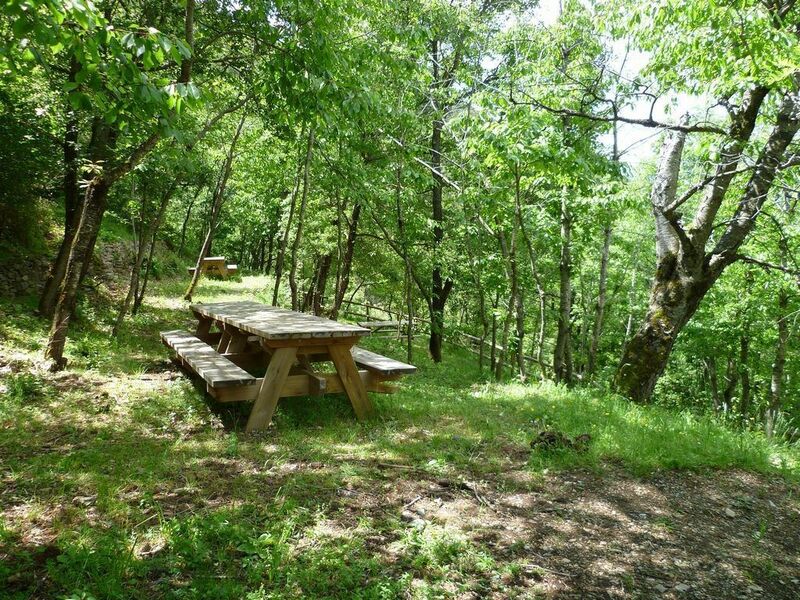 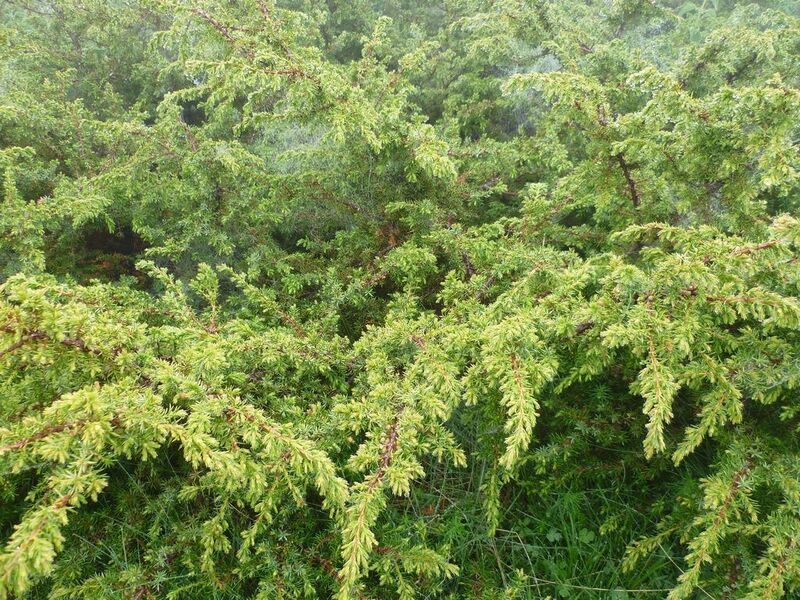 It’s ideal for all the family and children of all ages to stroll the surroundings of Rialp. The suggested route will take us twice cross the Noguera Pallaresa. 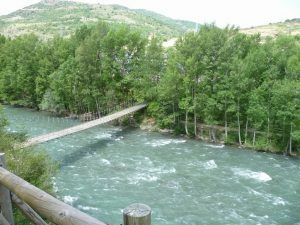 We start in the direction of Sort, the trails landing us to the sports area in the outskirts of Rialp where we cross the river. 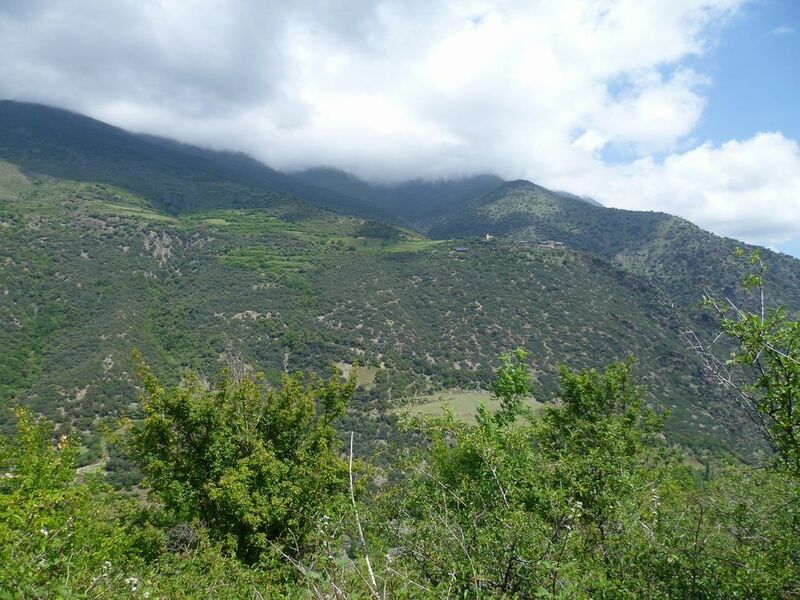 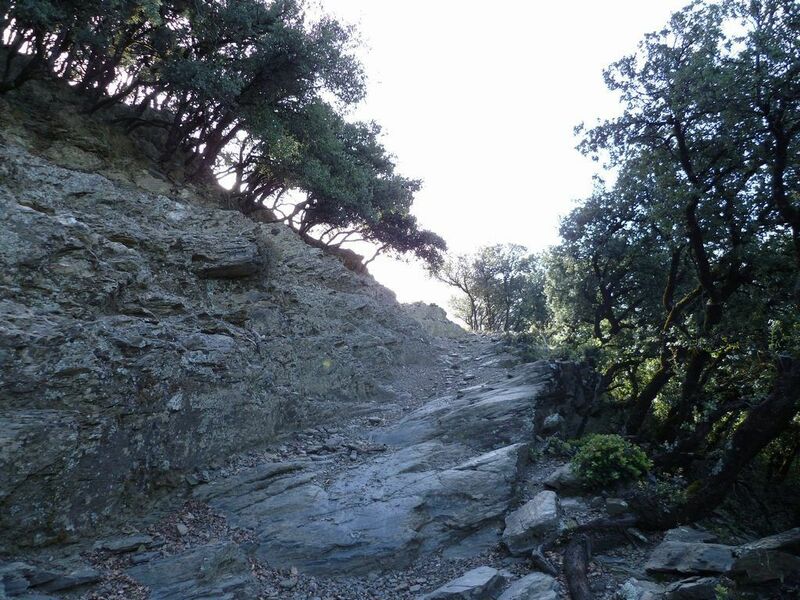 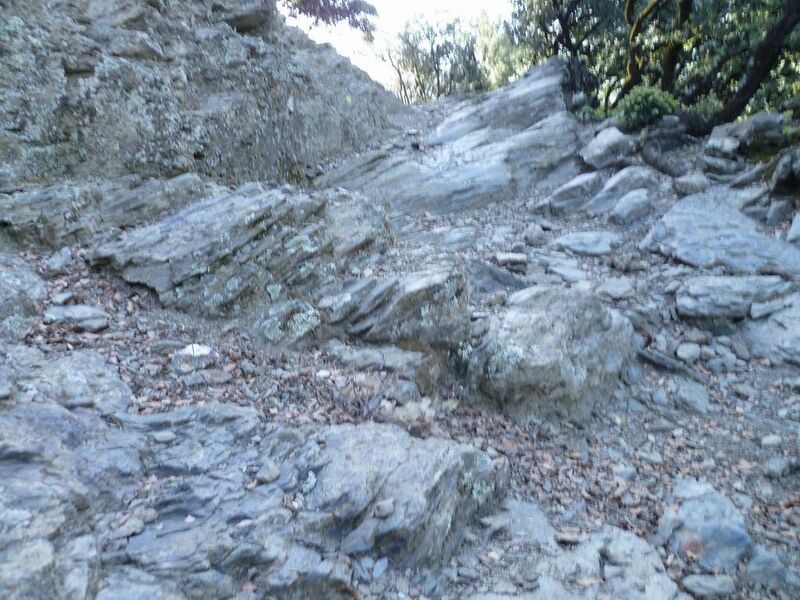 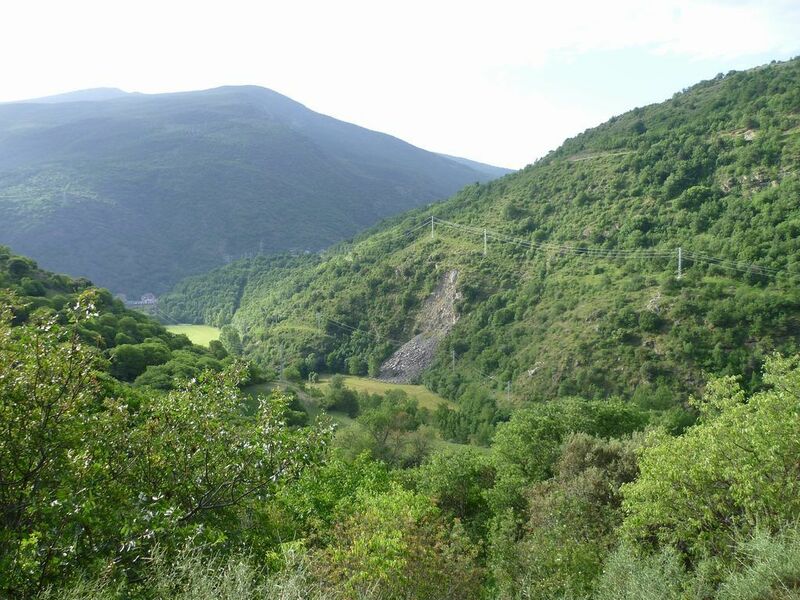 Here the most enjoyable part of the excursion will happen because we’ll be going parallel with the Noguera Pallaresa overcoming small gaps, always protected by a firm wooden hand rail, with fantastic views of Rialp, the Montseny of Pallars, and the Noguera Pallaresa. 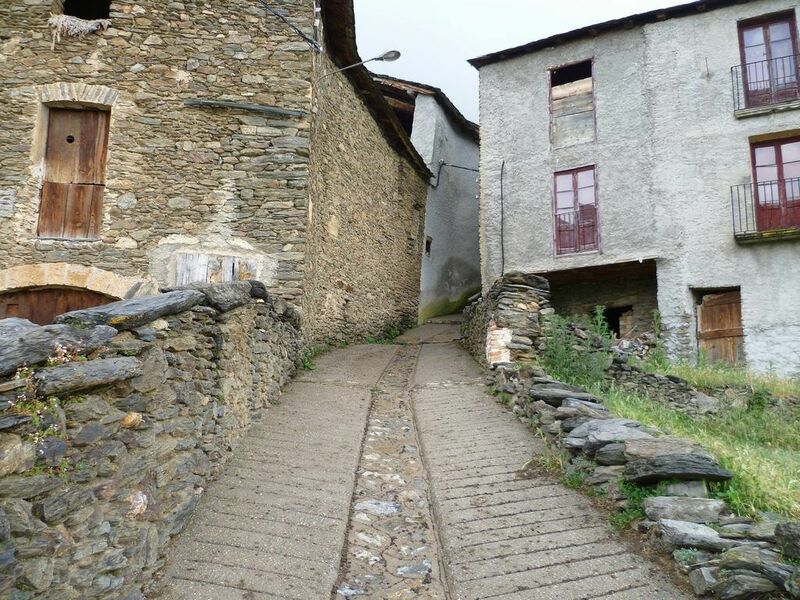 We return to the village swaying across the river gives us a very special end to our excursion. Drinking water is available from the fontain at the fontain of the Canerilla path. 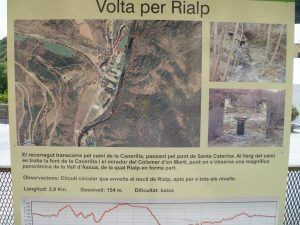 Culture: Rialp, Noguera Pallaresa, Pont de Santa Caterina i Font del Camí de la Canerilla. 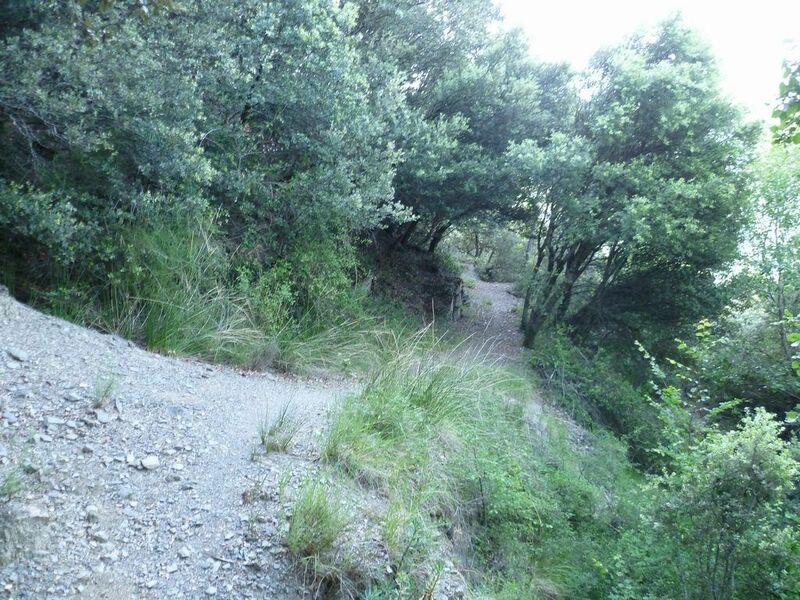 This circuit is for all the year round, as most of the circuit in the sun. 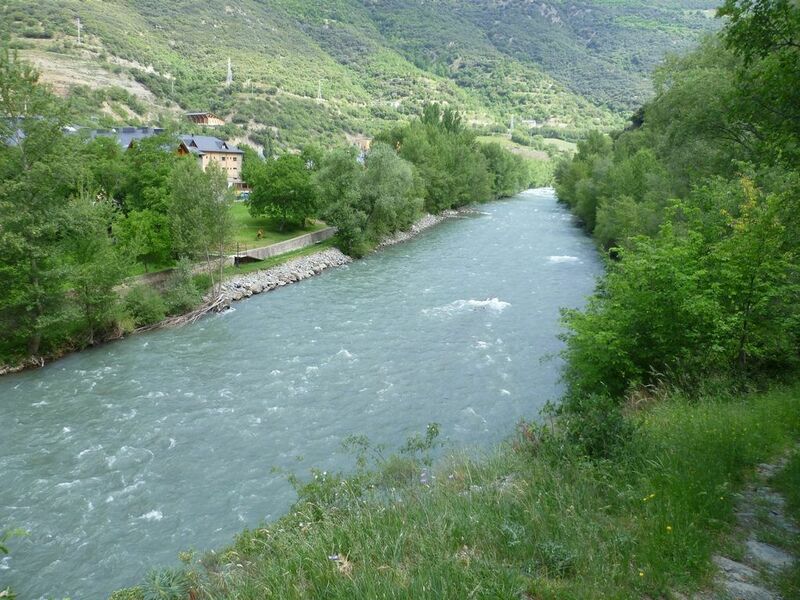 Apt for all the family Mola de Sall is ideal for a gentle strall with the offspring. 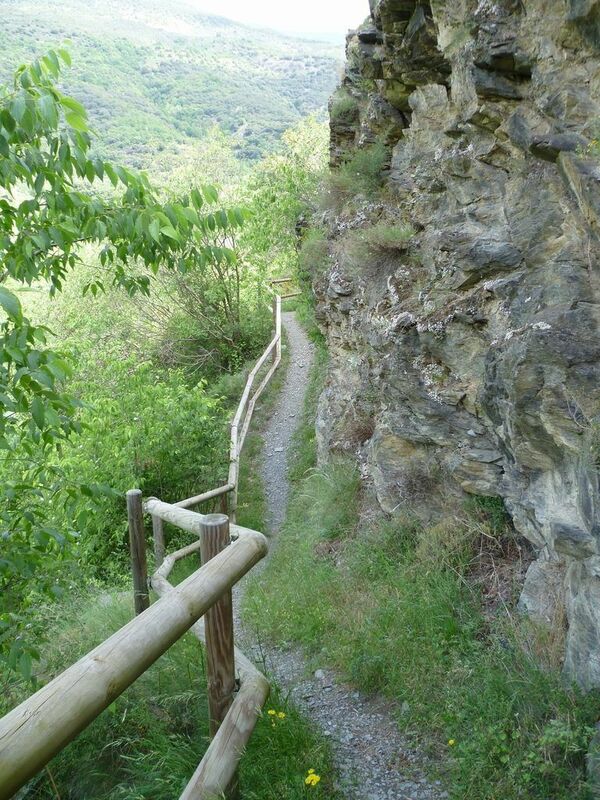 The distance and different levels of this circuit allows access for tchildren of all ages. 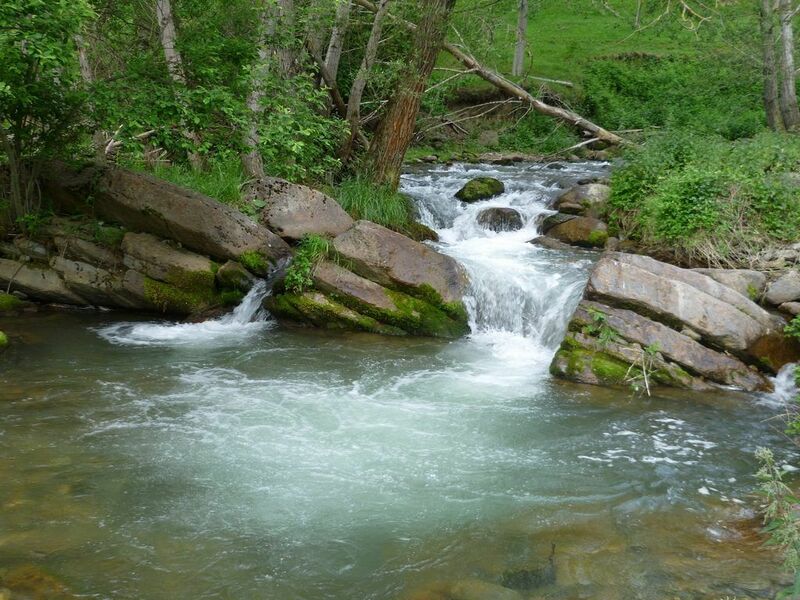 We can enjoy a wonder along shady paths and across cascades of fresh water. 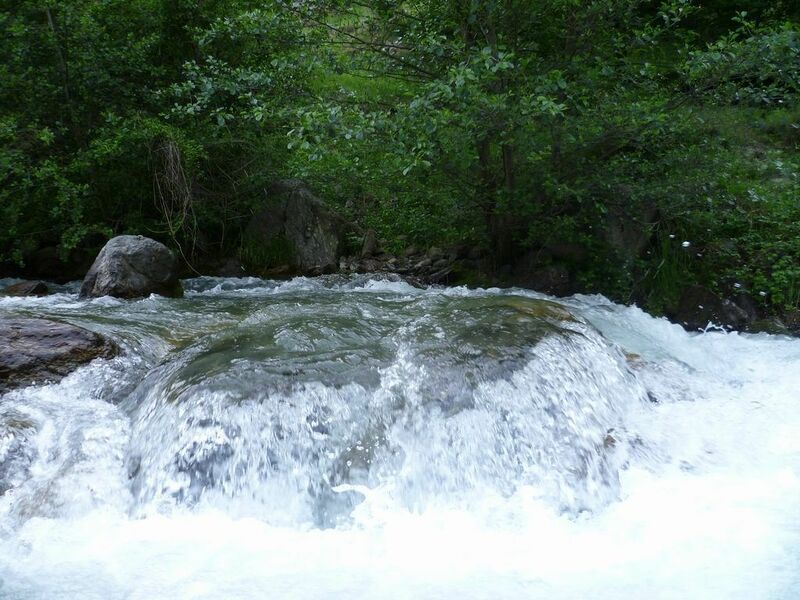 It is worth while stopping to have a look atl Mola de Sall and paddle in where the water streams meet. We can bathe in these waters and have lunch or a snack sitting on the grass or at the wooden table located just beside. 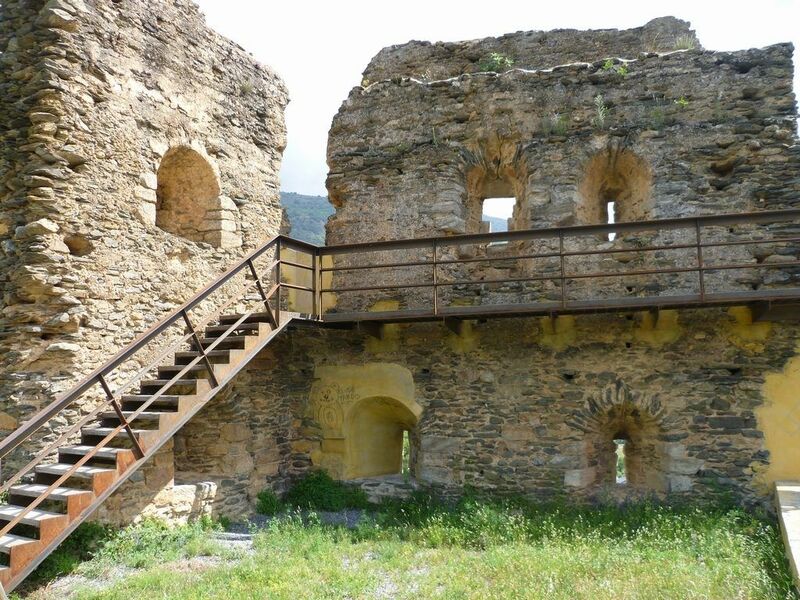 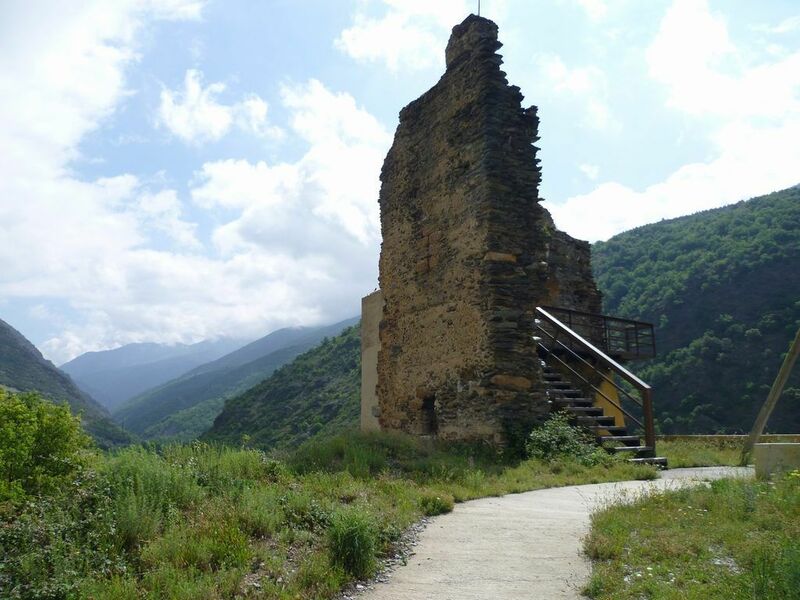 On return we visit the village of Surp and Rialps casttle. 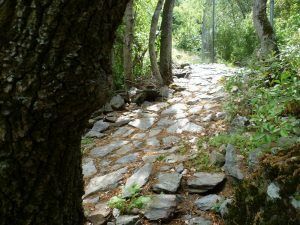 Leaving Rialp center we go quickly throught the village and take the first sector of the route and before crossing Sant Antonis stream we take the path to the right that will take us to the main road to Escàs and Caregué. 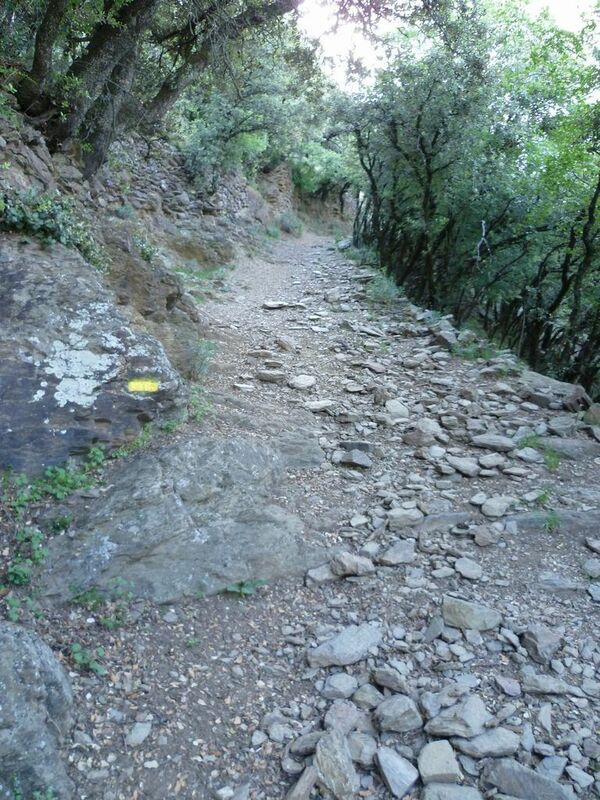 For about 500 mts. we must go carefully on the left, although theres not much traffic. 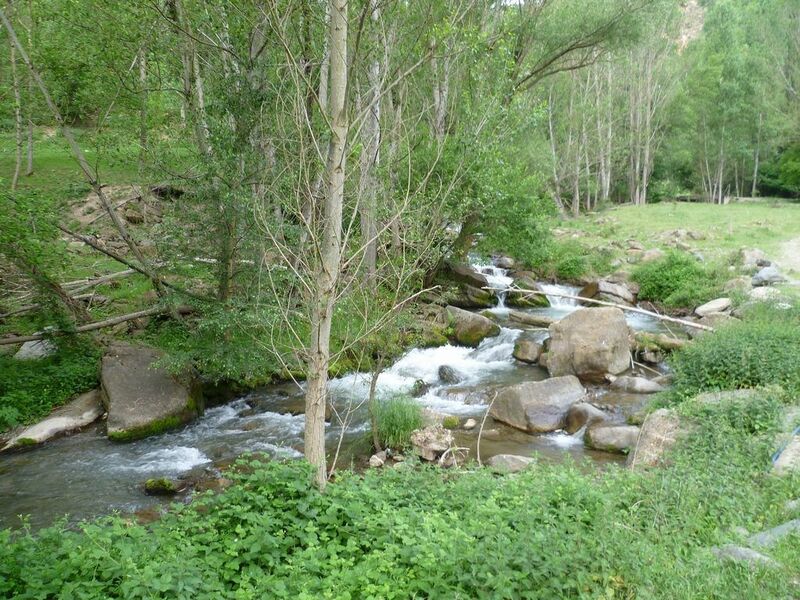 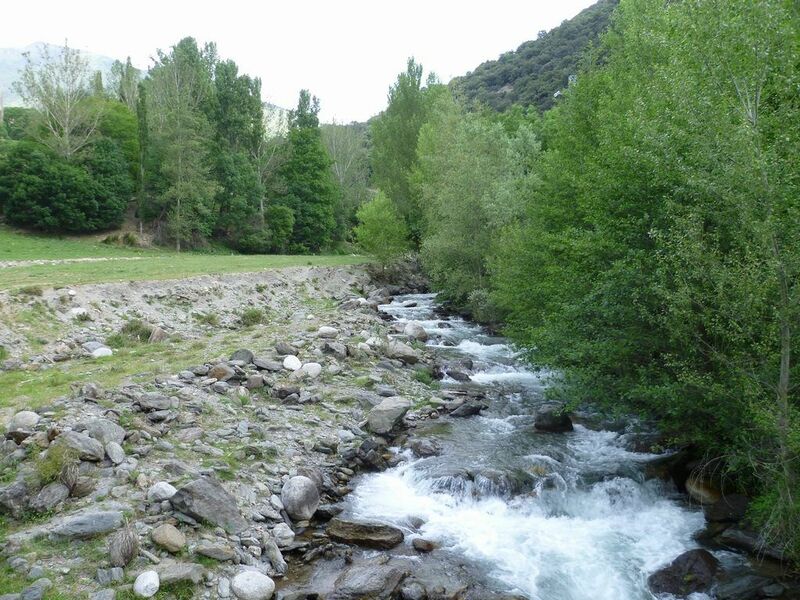 Once we have quickly left the main road we get to la Mola de Sall, where we cross the stream. 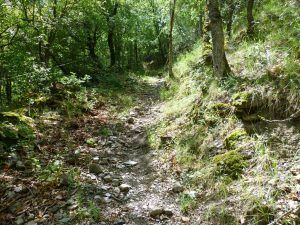 We return to the main road for aobut 300 mts. 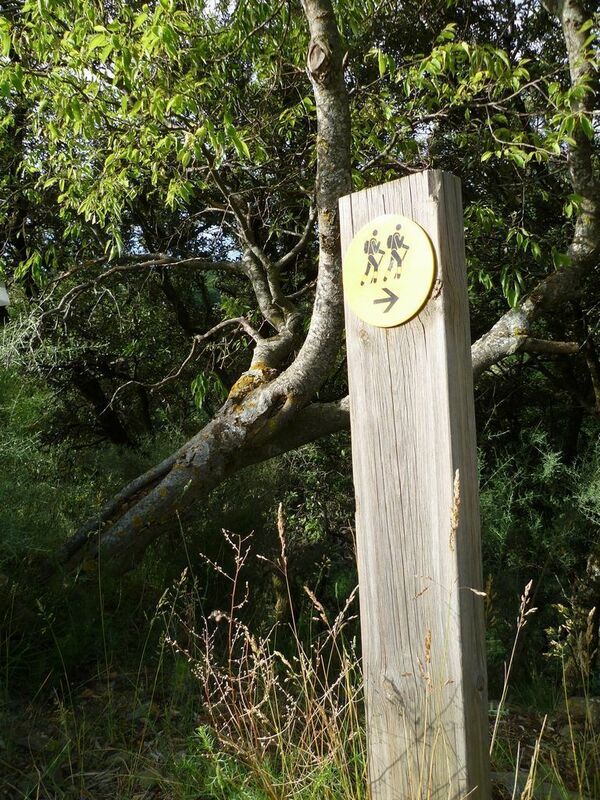 until we find a sign to the left that will tell us wich direction to take. first up a steep climb until we get to the round to Rodes and continue upwards but with loss of an incline we arrive at Surp. 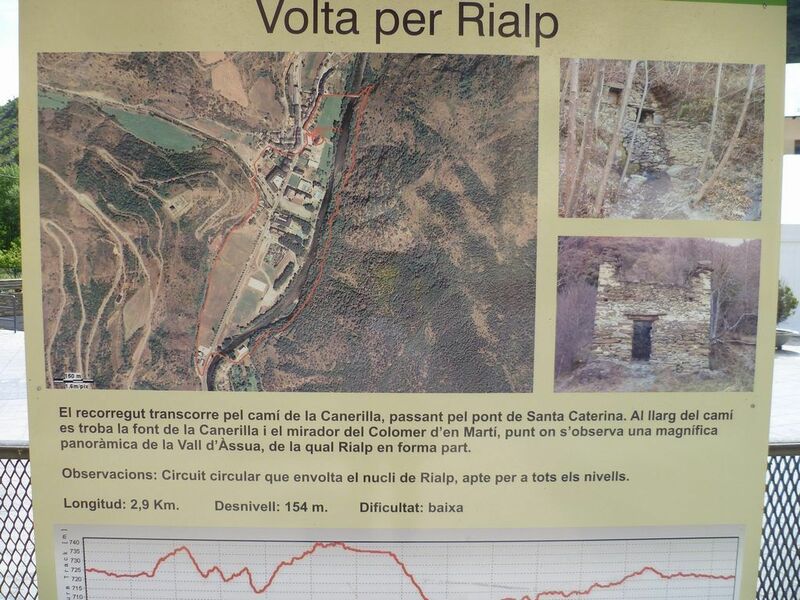 From the village we go down the path from the casttle to Rialp. 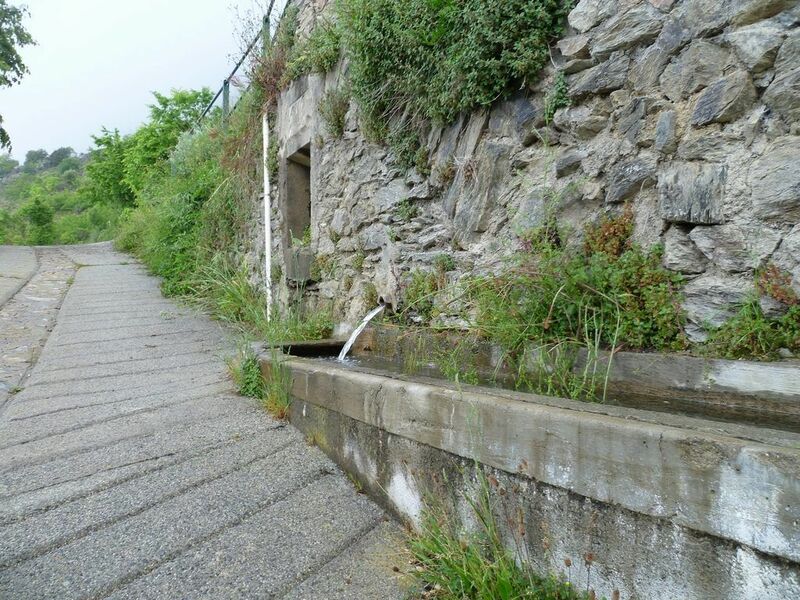 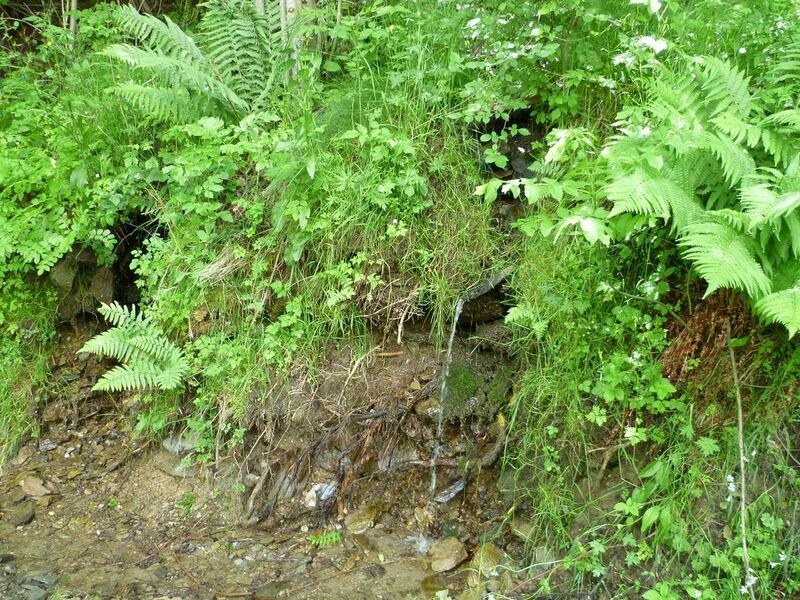 There is drinking water to refresh in Sant Antoni’s stream, Mola de Sall and fontain in Surp. 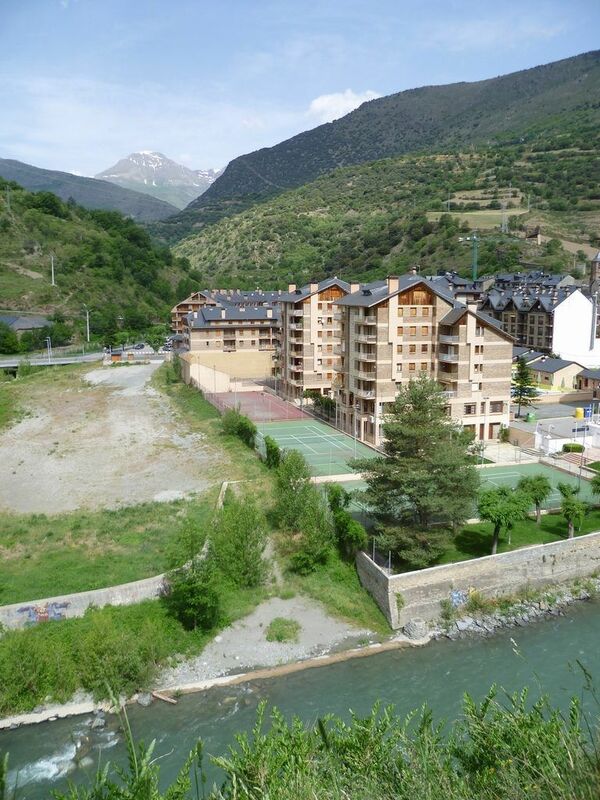 This familiy circuit, availabel all year round, is perfect for visiting Rodés and enjoy its panoramic views. We will join the two centres down the traditional path taht has unied them for centuries. 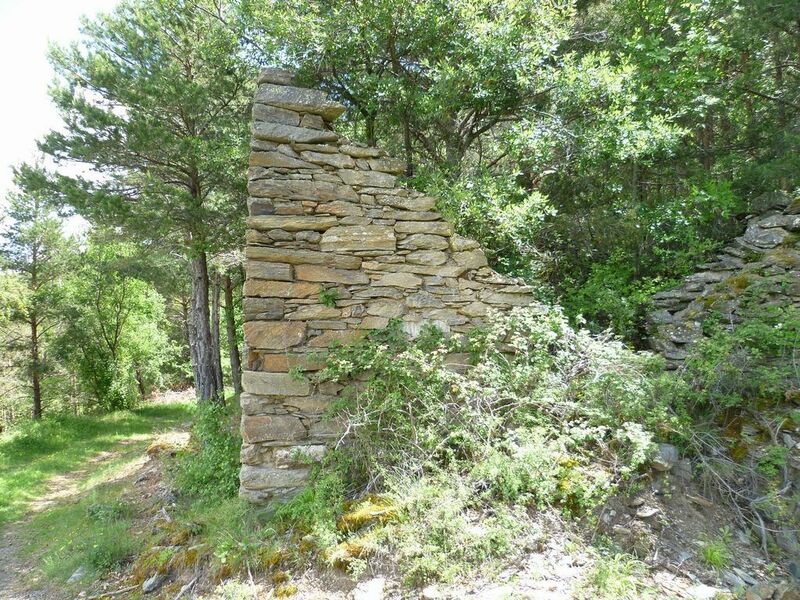 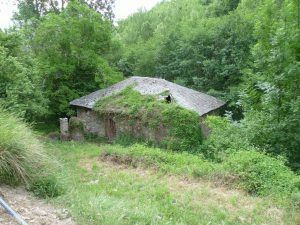 Leaving Rialp we quickly cross over the castle and at the hunters cabin we join join the path that takes us up to Rodés. 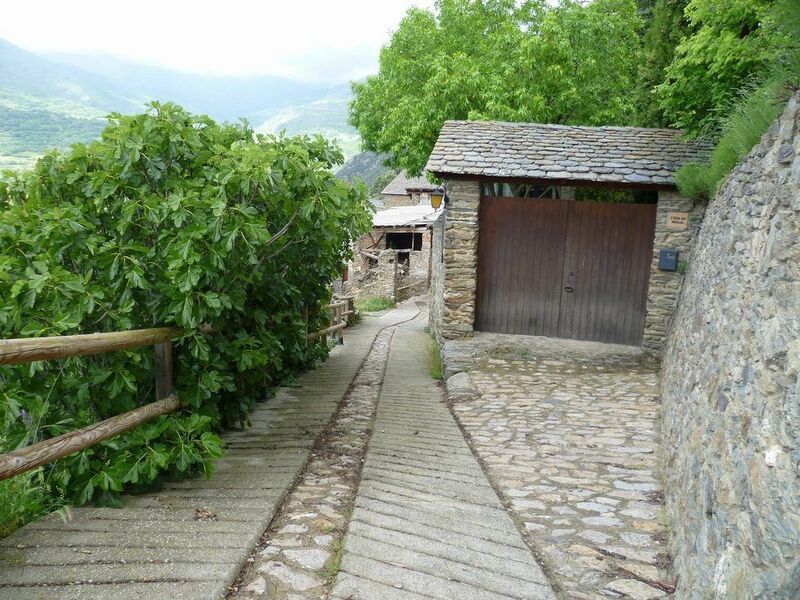 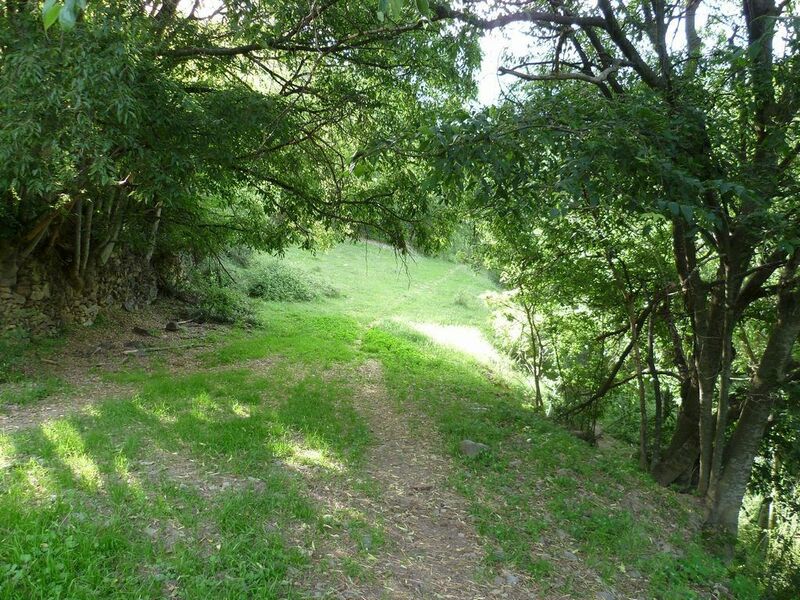 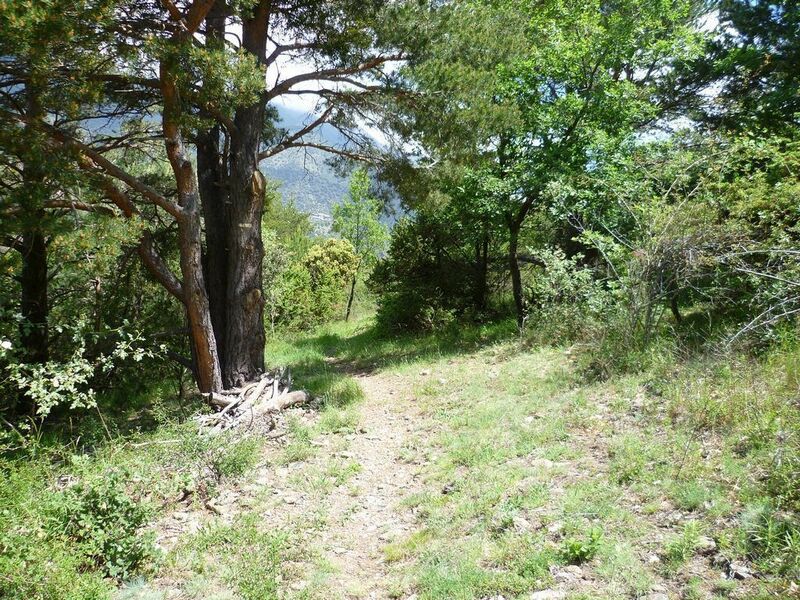 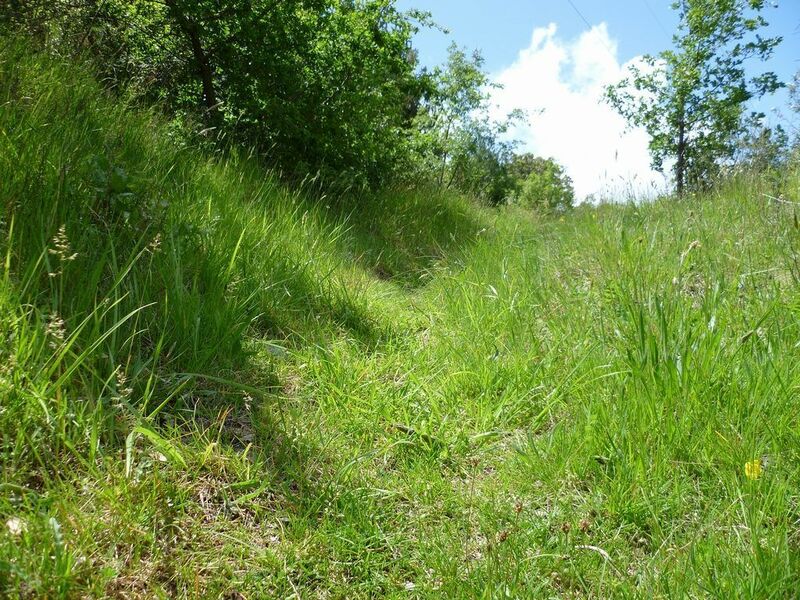 This path threads between oak trees climbing quickly at the begining first, up a wide path and later up a narrower one, always going up with afternating intensities we arrive at the village square, where we can enjoy good views and visit the small centre. During the trail we wont find any fountains. There’s no dinking water on this route and although all the trail is on the shade, in times of extreme heat we must bring plenty of water to keep us hydrated. 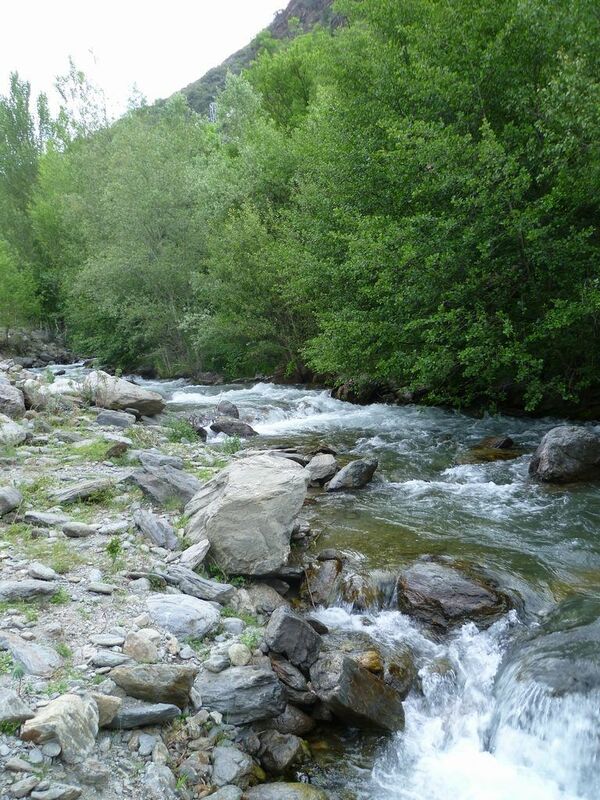 In Rodés we can restock with water before returning. This circuit is suitable for families all year round. 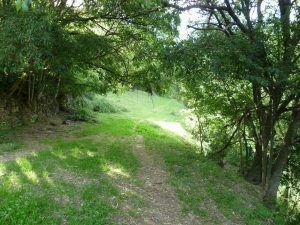 We recomend not doing it at midday in summer as there is very little shade. 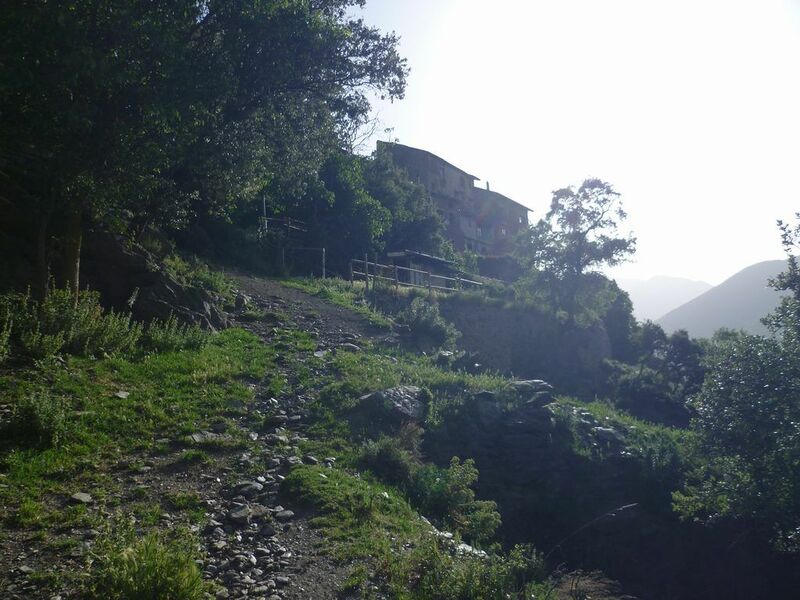 There is no drinking water to be found in the way but in the village there are several fountains where we can stock up for the descent. 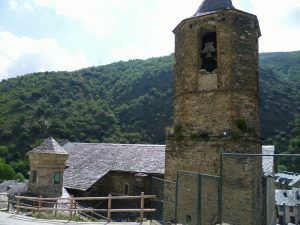 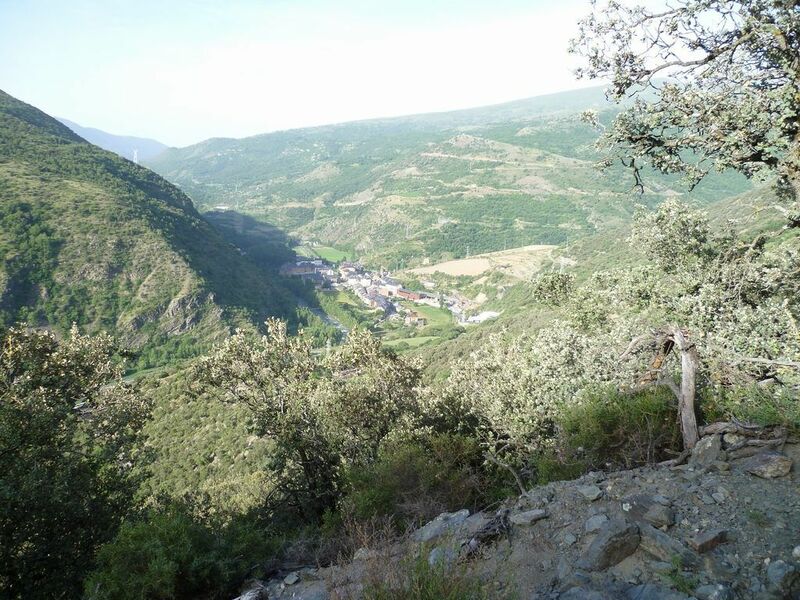 The circuit goes down the “Camí de la Ferradura” (blacksmiths way) wide has traditionally joined these two villages of the Vall d’Assua mainly for the post and casttle running. 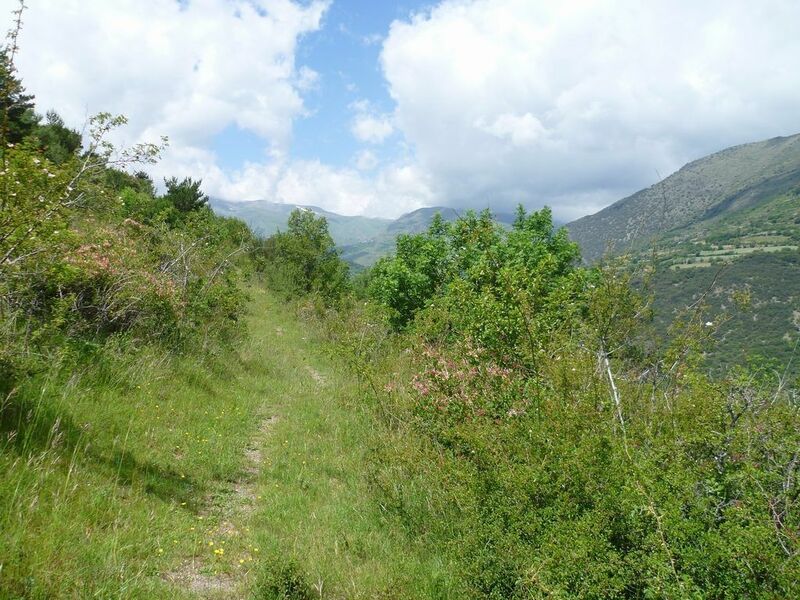 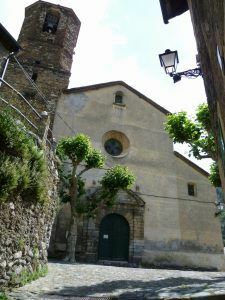 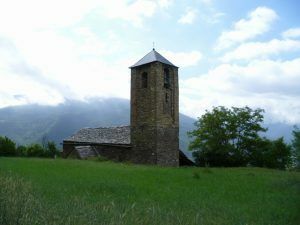 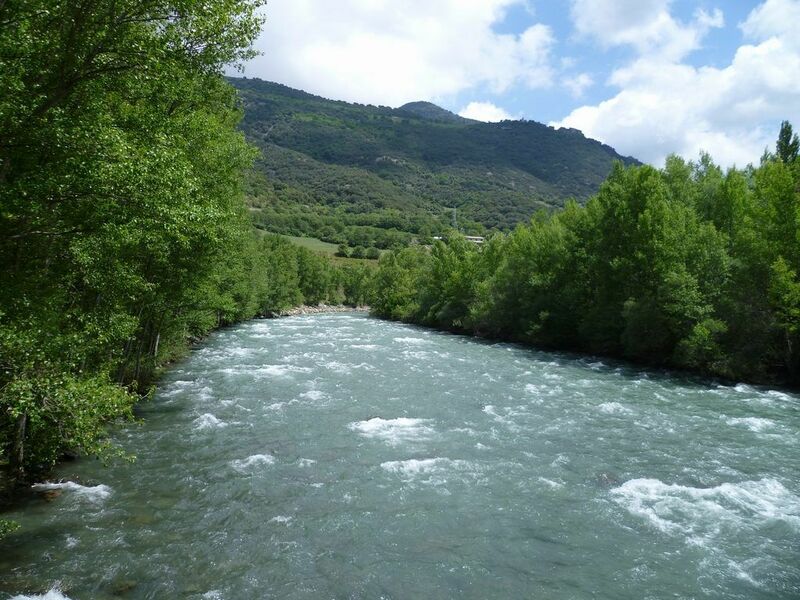 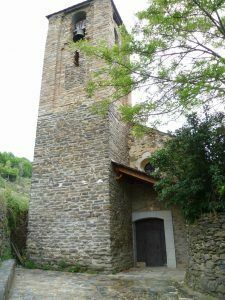 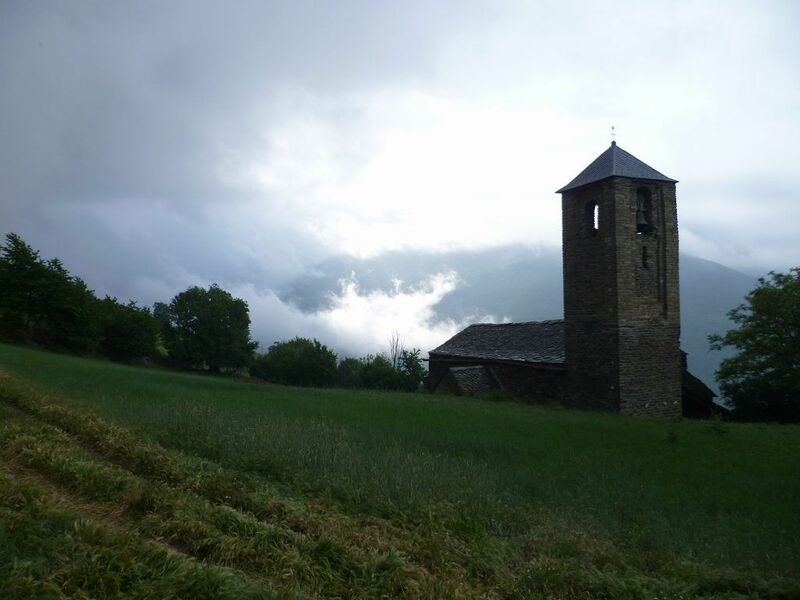 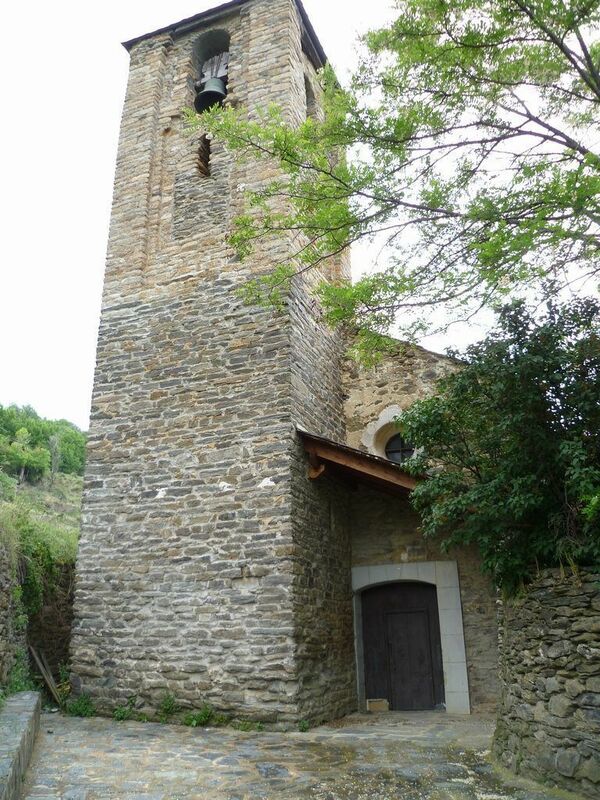 The trail is ideal for enjoying the tranquility of contry life and its worth a visit to centre of Surp to see the churches of Saint Iscles and Saint Victoria. From Surp there are good views of the villages in the valley Noguera Pallaresa and the centres of Beraní and Roní situated in the shadow of Mount d’Orri. Leaving Rialp the trail quickly climbs up the old quaters arriving at the ruins of Rialps casttle. 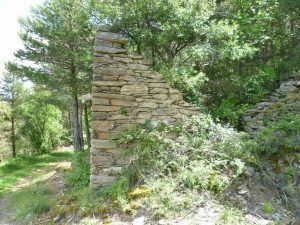 We soon rejoin the “Blacksmiths way” that will take us without stopping to Surp, always keeping within the borders and cultivated fields. 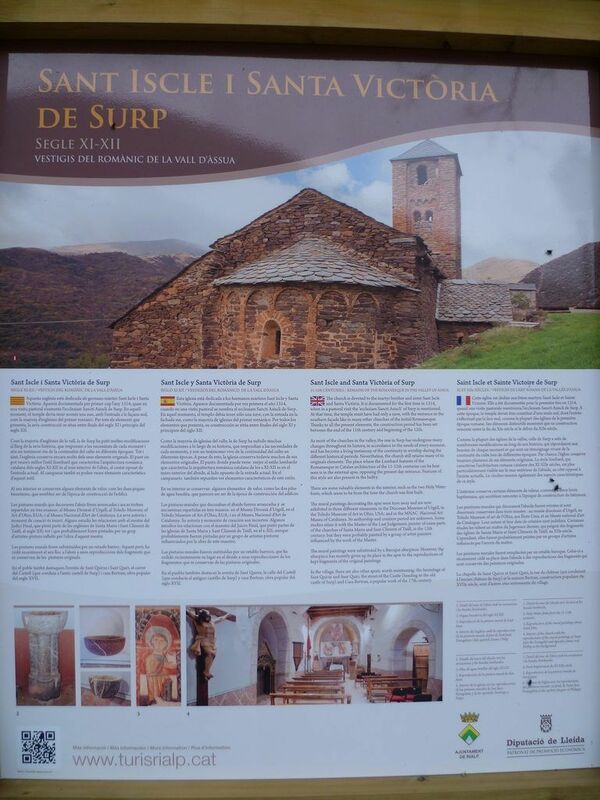 Culture: Rialp, Castell de Rialp, Església de Sant Iscle i Santa Victòria, Noguera Pallaresai Surp. Circuit available all year round, just being careful in winter with the frozen patches beside the river and the fountain. 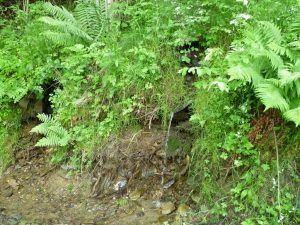 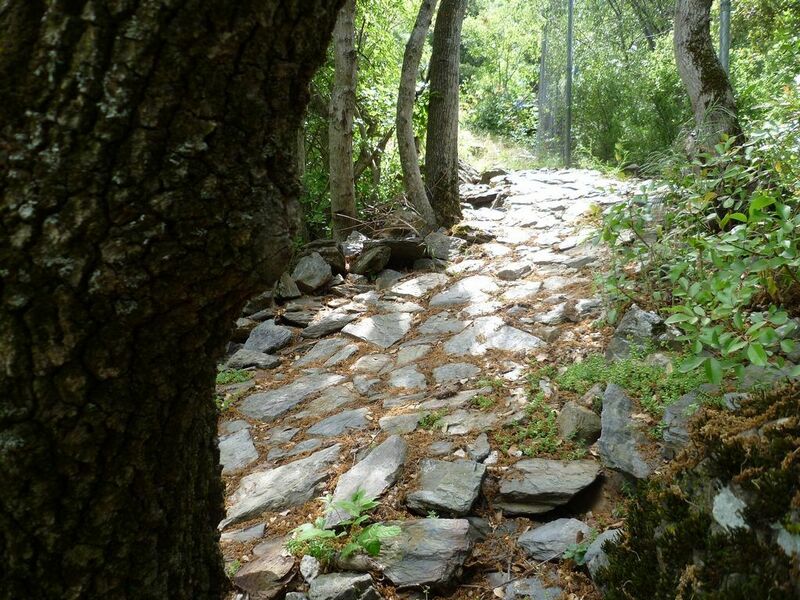 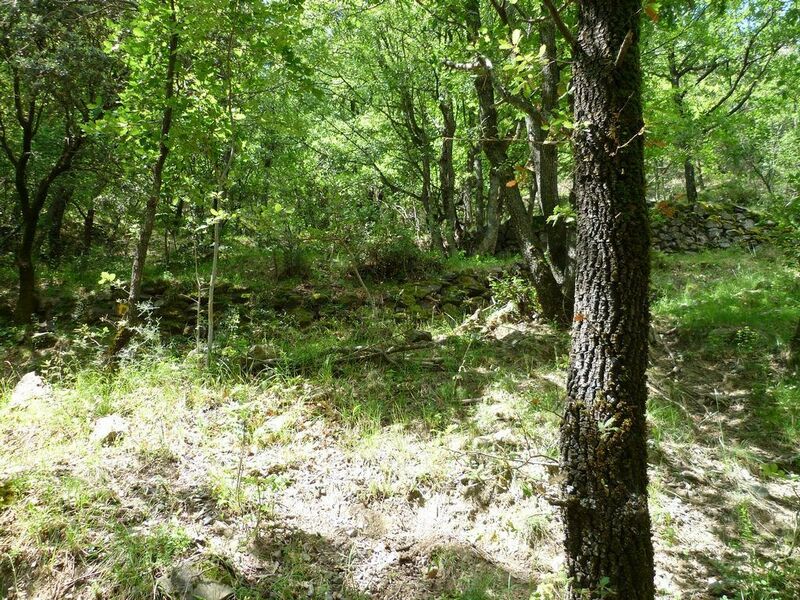 In this familiar circuit of Colinos we can enjoy a trail along shady paths and also a fresh water fountain. 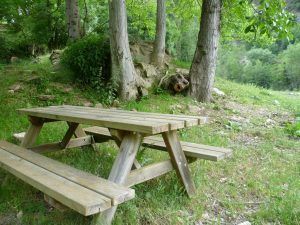 In Sant Joan de Colinos there is a shady and well equiped picnic area. 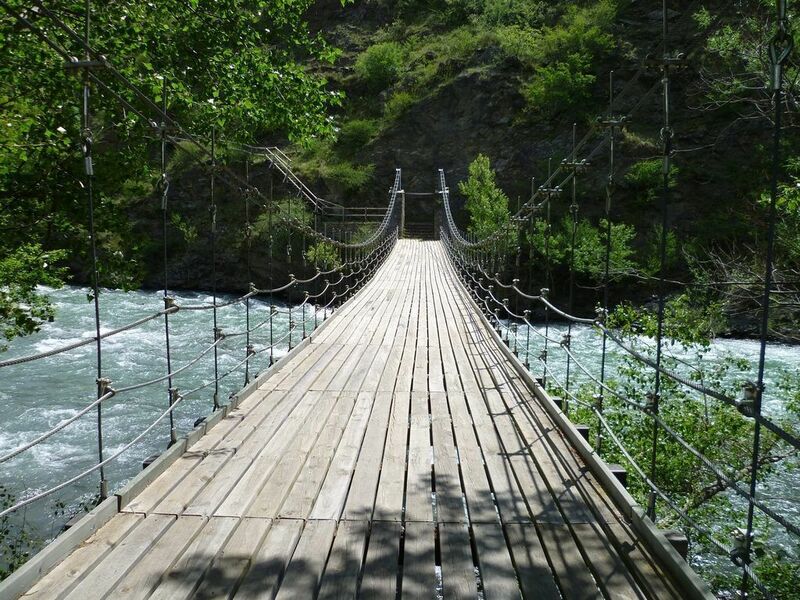 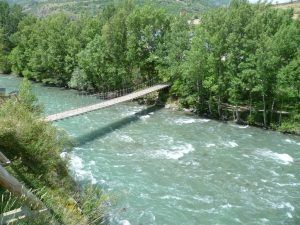 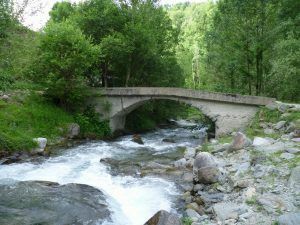 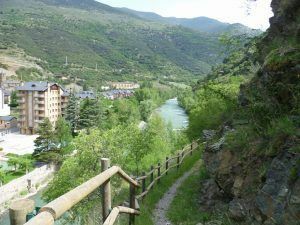 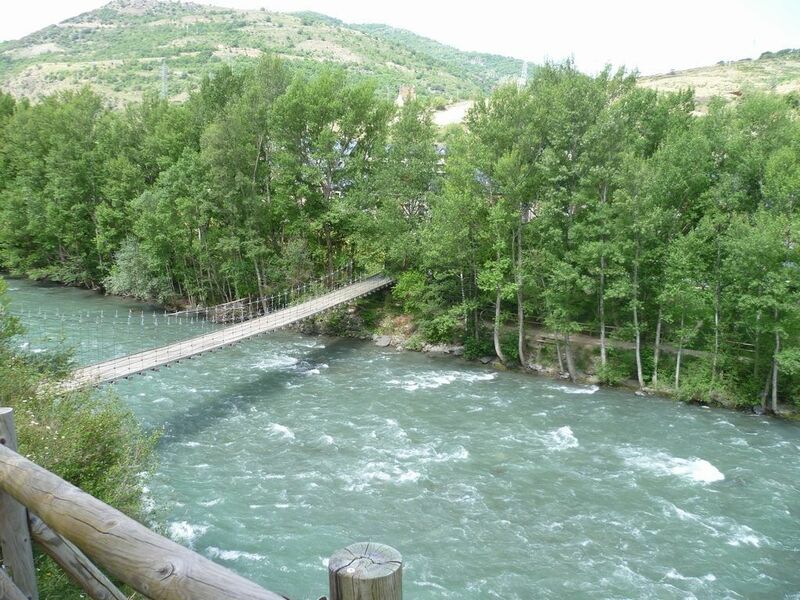 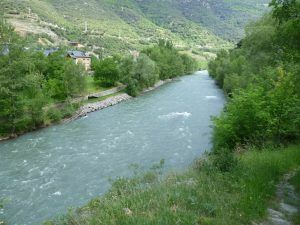 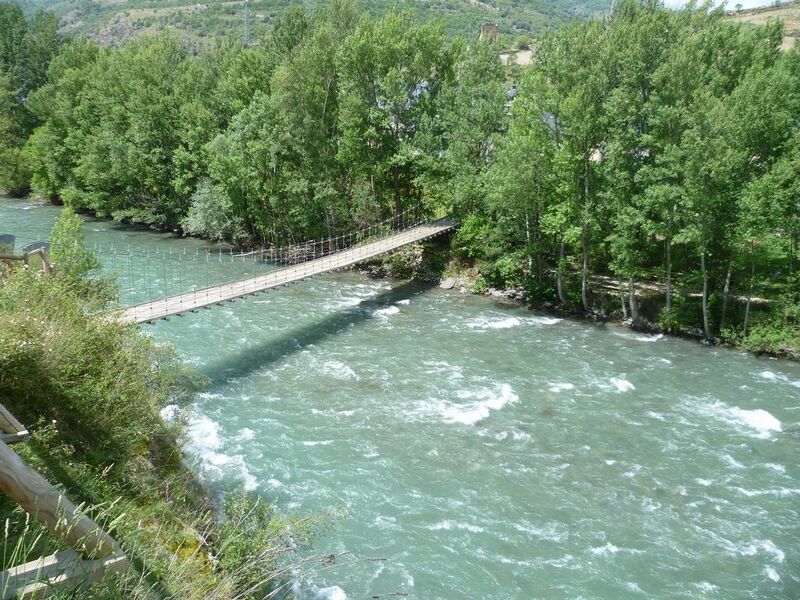 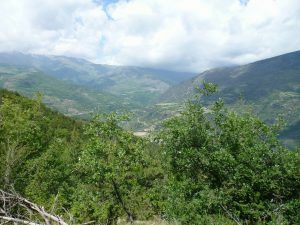 Leaving the centre of Rialp we cross the village and Santa Caterinas bridge to begin the trail paral·lel to the river. 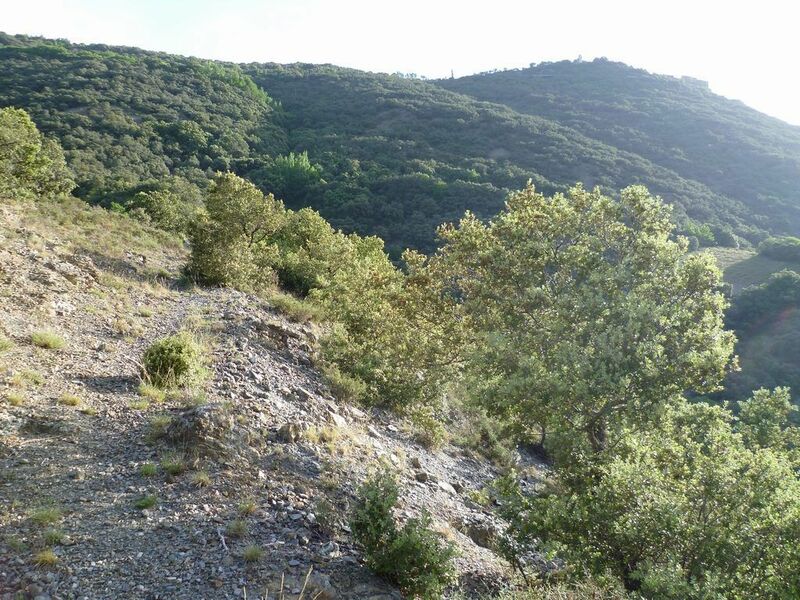 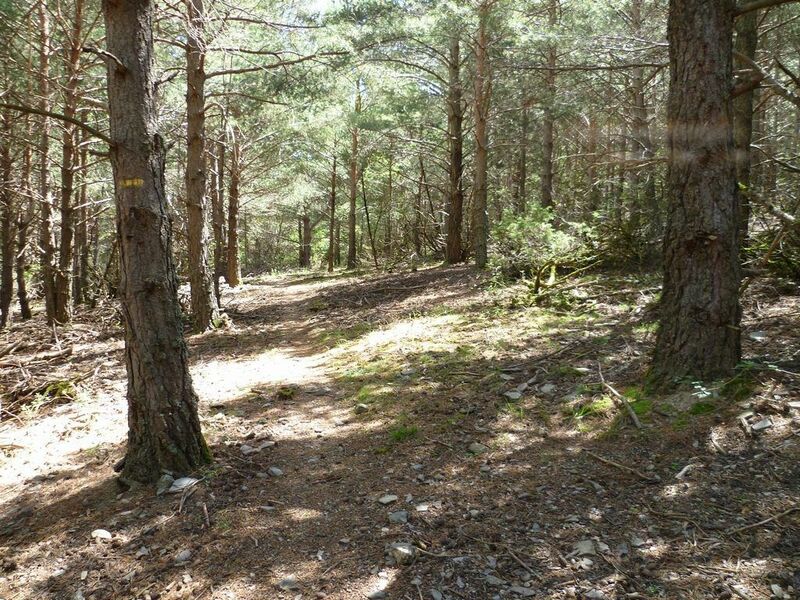 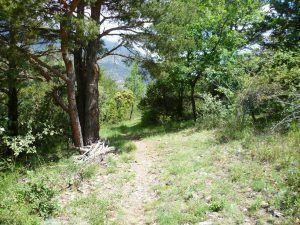 Shortly we leave the route to Canerilla (first route on this page), and then the path begins to climb consistently upwards zigzaging with we reach the Sant Joan de Colinos recreation area. There we can relish the calmness of the surrounding resting in the shade. There are 8 tables, all in the shade and a fountain very close. 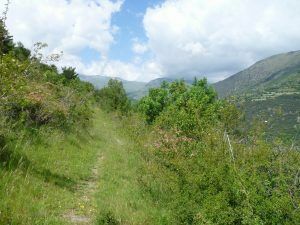 We can either go back the same way way or follow the trail that starts in front of the recreational area that leads to the village of Berani (in the second option we would have to picked up by car). 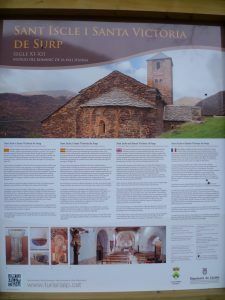 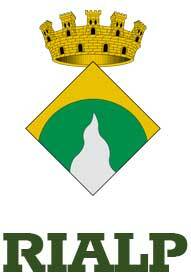 Culture: Rialp, Pont de Santa Caterina i Beraní.